Dame) on 2015 October 11.99 UT across an airmass range of 3.6-4.5, which yielded noisy data, indicate the nova to be an Fe II-type classical nova (ATel #8156, http://www.astronomerstelegram.org/?read=8156). Spectra by M. Fujii (Kurashiki, Okayama, Japan) obtained on 2015 October 12.421 UT at Fujii Kurosaki Observatory indicate a highly reddened nova (CBET 4150). His spectrogram is posted at http://otobs.org/FBO/etc/tcp_oph.htm. Charts: Charts for Nova Oph 2015 No. 2 may be created using the AAVSO Variable Star Plotter (VSP) at http://www.aavso.org/vsp. Be sure to include spaces in the name as shown. 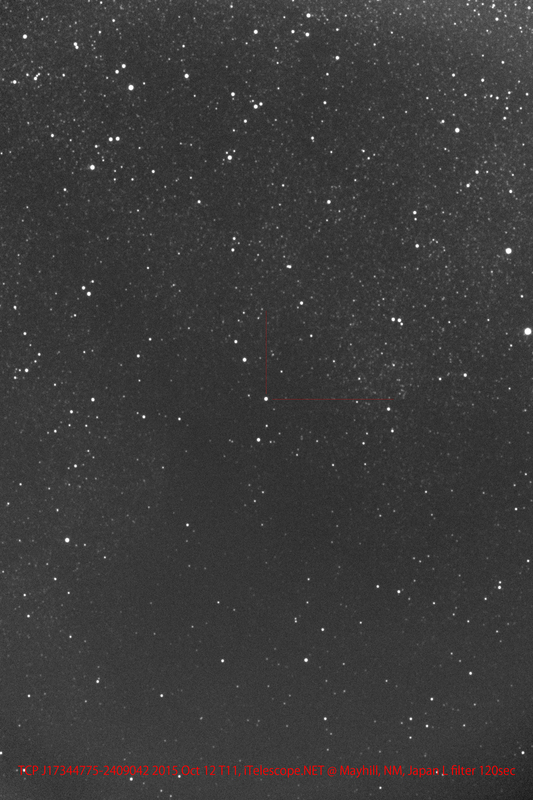 f/6.8 astrograph + CCD(FLI Proline 16803)at the iTelescopeNET, Siding Spring, Australia). a. Announced in IAU Central Bureau for Astronomical Telegrams Central Bureau Electronic Telegram 4150 (Daniel W. E. Green, ed.). Assigned the name TCP J17344775-2409042 when posted to the IAU CBAT Transient Object Confirmation Page (TOCP) at http://www.cbat.eps.harvard.edu/unconf/tocp.html. The majority of information in this Alert Notice was provided via CBET 4150.
c. Nishiyama and Kabashima report the nearest star in IGSL3 has position end figures 47.352s, 02.06", distance 5.9", and magnitude R2=18.55, I=16.44. P. Schmeer (Bischmisheim, Germany) reports the nearest USNO-B1.0 catalog source is USNO-B1.0 0658-0470476 (p.e. figures 47.346, 01.77), R1=18.88, R2=18.55, I=16.44. S. O'Connor reports the IR/2MASS source IRAS 17317-2407 has p.e. figures 48.27s, 02.6s. Shigehisa Fujikawa on their discoveries!